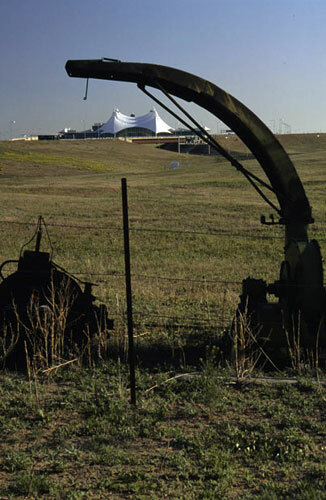 Fenceline Artifact is a permanent public art installation created to memorialize the agricultural life either lost or displaced by the construction of Denver International Airport (DIA), whose 53-square mile footprint was created in the early 90’s. In preparation for the installation, the artists met with farmers who had lived and worked on farms on or near the future DIA site to discuss their lifestyles and relationship to land and landscape. Fenceline Artifact relocates some of the agricultural artifacts of these farms as both historical marker and foreground for the new DIA “installation.” The Fenceline consists of a 1000-foot-long collection of found and acquired objects (such as piles of bailing wire, a variety of farm implements, augers, rakes, harrows, and plows, in addition to a tractor, bean thresher and several feed troughs), along a reconstructed fence-line within sight of the airport. Four small galvanized-metal farmhouses both replicate and memorialize the original farmhouse landscape, and native hackberry and cottonwood trees are planted among the historic objects to represent the native landscape. The Fenceline was collected and constructed along the road to DIA as a reminder to speedy travelers of the uneasy accommodation of the landscape when new inhabitants dislocate the old.